Subdivision is the process whereby a parcel of land is divided into two or more parcels in order to obtain separate legal titles for each parcel. The landowner may make an application for subdivision, or hire an individual such as a professional planning consultant or an Alberta Land Surveyor, to make an application on the owner's behalf. Hiring an expert to manage the application helps ensure the process remains efficient. Convert existing buildings into condominiums. The subdivision submission information package, including a process of approval flowchart, outlines the necessary steps. For more information about the subdivision process, contact a subdivision planner. 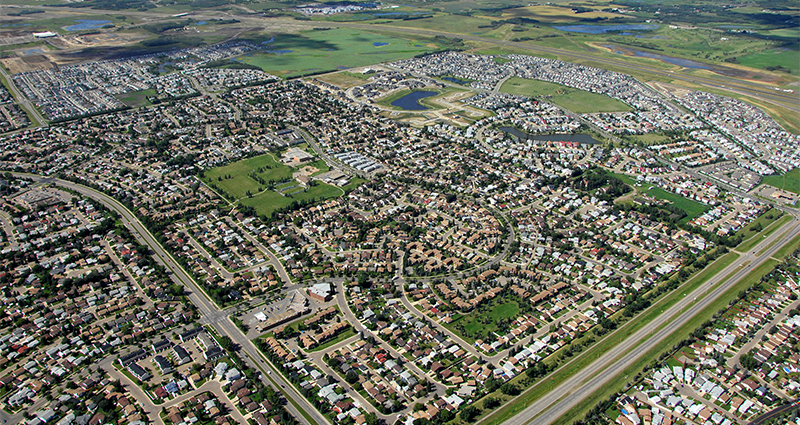 If you are considering subdividing a property, the City of Edmonton's Planning Coordination Section uses a web-based Land Development Application (LDA) process for all subdivision applications processed by the Branch. The online application form asks users to register for an account. Once registered, applicants can monitor the progress of their applications online. Applications are categorized into two types, Major and Minor Subdivision Applications. Often occur in new areas where new infrastructure (for example, roads, underground utilities, parks, and so on) have not been constructed yet. Often occur where infrastructure already exists and the land use class is staying the same (for example, the creation of one additional lot from parcel that is already zoned for residential uses). Please see below for more information for the requirements on the different types of applications. the “tentative plan of subdivision” (see below for more detail on this). Depending on the application, additional documents such as an Environmental Site Assessment, conceptual schemes of future surrounding subdivisions, a computational sheet detailing the breakdown of land uses and units, and a property value appraisal report may be required. Once an application is accepted fees are applied. The fees must be paid before the application will be processed. Your application will be circulated to City departments and other affected agencies. In some cases, adjacent land owners will be notified. The responses will be reviewed and your application will be approved or refused. Subdivisions in mature areas generally fall within the minor subdivision category because the major infrastructure already exists. Please note the tentative plan of subdivision must be a digital drawing. We recommend contacting an Alberta Land Surveyor or professional planning consultant to submit an application on your behalf. Typically, minor subdivision applications can be reviewed and a decision can be made within a 60-day period. More information can be found on the City of Edmonton’s Infill page. Section 623 of the Municipal Government Act (MGA) requires City Council to appoint a subdivision authority to exercise subdivision powers and duties on behalf of the municipality. In Edmonton, City Council has delegated authority to the City Manager who, in turn, has delegated authority to the Chief Subdivision Officer. The subdivision authority reviews technical matters involved in subdivision proposals, including conformity with statutory and non-statutory plans and the implementation of any public improvements the administration needs to include in associated servicing agreements. Subdivision authority meetings are not open to the public. A "conditions of approval" letter is sent by the Subdivision Authority, which may include conditions such as the request for an easement to protect a utility service or provide access to a property or properties. Another common condition of subdivision is that the applicant enter into a servicing agreement with the municipality in order to construct certain improvements such as sewers, water, and roads so that the properties within the subdivision are properly serviced. The Servicing Agreements web page contains more information. Please note, minor subdivision applications typically do not require a servicing agreement. The applicant may also be required to pay certain fees and assessments, such as sewer or roadway assessments, which help pay for larger shared infrastructure from which the lands will benefit. See Fees and Assessments and Financing New Sanitary Sewer Trunk Construction for additional information. Only the applicant, the municipality, the school boards and the provincial government may appeal subdivisions. Adjacent property owners are notified of applications when received and are invited to comment, but have no right to appeal decisions. The Municipal Government Act also allows subdivision to be appealed to the Municipal Government Board on matters of provincial concern or inter-municipal dispute. The Municipal Government Board is a provincially appointed board. Prior to going to land titles to register your lots, each Plan of Survey must be reviewed and consent granted by the Subdivision Authority. The review consists of reviewing the Plan of Survey and confirming that the conditions outlined on the Conditions of Approval letter have been completed. After the Subdivision Authority has endorsed the Plan of Survey, the approval form will then be sent back to the surveyor, ready for registration at Alberta Land Titles. A submission is not considered complete until all the conditions have been met. It is recommended that a surveyor make the submission on your behalf. If required, please send three (3) hard copies of any Restrictive Covenants (berm and fence, top of bank and pipeline) that require our signature to execute. Please email subdivisions@edmonton.ca if you require assistance calculating endorsement fees. List of policies that may be considered in making subdivision decisions. A Word document can be obtained by contacting a Subdivision Officer.